The world of work is changing, and more and more people are looking for meaningful work and not just something to get us by. However, the most difficult question to answer is – where do we even start? The Change School recently held a two-day Navigating Career Crossroads workshop with the Young Women’s Leadership Connection (YWLC) followed by a Change Talk with Lydia Lee, Screw The Cubicle on Career Change: How to De-Risk Career Transition. My key takeaway from both sessions: a successful career change is about making choices that are aligned to your values and passion. There’s a plethora of reasons that may hinder us from pursuing a career that matters to us – the security of a stable, high-paying job, un-supportive family or friends, or the sheer risk of failing… and the biggest reason of all? We are our own greatest barrier. Perhaps it’s not a surprise, but it’s usually our own beliefs and preconceptions that prevent us from taking that first step. How do we overcome this? Honesty. 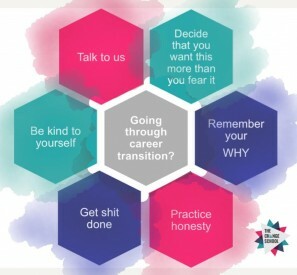 Career transition is about being brutally honest with yourself about your values, beliefs, skills, and finances, especially. It takes a lot of self-work to figure out what our values and skills are, in order to create the life and career that we really want. It takes guts to face our own biases, filters, and to shut down that inner voice telling us to not be stupid and instead, dive into the unknown. It takes fearlessness to confront the things we are afraid of, and decide that we are bigger than any of them. The first question to ask ourselves when considering a career shift is Why. Getting clear about why you want a change helps to define and ground us in where we want to go and who we want to become. It is only when we’ve established the Why, that we can be honest with ourselves about what we can and cannot live with, and how much time and investment is needed to reach our goals. Getting comfortable with change means getting real about what it takes to make change happen. There is no such thing as ‘zero risk’. Managing the risk of career transition is about ‘getting real about money’. It also takes time, patience, and acceptance. At some point we are going to doubt ourselves, feel overwhelmed, fail. We will have to make sacrifices; to make time even when it doesn’t seem possible, and we are going to have bad days. This is why it’s also important to be kind to ourselves. It’s definitely not going to be smooth sailing, and we’ll make mistakes along the way. But by practicing self care, we learn to pause, breathe, and keep moving forward. Some days you’ll want to throw in the towel. Instead, take a few hours off - even a day if that’s what you need to slow down and re-calibrate. Throw on a Netflix, order that pizza, talk to a friend or a mentor, and recall why you wanted this to begin with. Remember that your career is a journey and process of self-discovery. Rather than anticipating the outcome, learn to enjoy the process. So celebrate the small victories. Know that there is no one way to do things; you can always change your strategy, you can stick to what you want to do and experiment with side hustles, or do freelance work to gain experience and get paid along the way. Change is never easy, never not-frightening, but if we all focus on the value that we want to create within ourselves, our communities and the world, we are already on the right track to where we’ve always wanted to be.